This basic guide is designed to give you an understanding of the Classifieds section. The 'Cliffnotes', if you will. For the full list of Classifieds Guidelines, see this thread. It is a form of advertising in small messages grouped under a specific heading (classification) such as automobiles, employment, real estate etc. The PCS free online Classifieds section is to be used to buy and sell fish and aquarium related livestock and items. PCS Club Members may sell occasional non-aquarium goods in the 'Off The Wall' section. Unauthorised commercial trading is not permitted. How do I post a Classified Ad? This button will let you post a new ad. Use the supplied templates to list your goods and price, and how you can be contacted. Post a complete ad from the start for best results. How do I respond to a Classified Ad? The ad will contain details on how to contact the seller, perhaps by PM or phone. You contact the seller, not the other way around. Unnecessary replies (ie. offers, 'PM Sent', silly questions, etc) will not be tolerated. How can I return my ad back to the top of the list? By posting a reply to your own ad, you will 'bump' the ad to the top of the list. You may do this once every four days. What do I do when all my items are sold? You can use this button to edit your ad to replace the text with 'Sold'. It is also good practice to change the ad's title to say 'Sold'. Do not 'bump' the thread to say that it has sold. 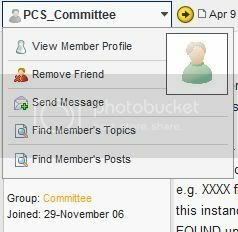 If you are a PCS Club Member you may also lock your own thread. If you are not a club member and you would like your thread locked you can PM a moderator to do so. Selling in the PCS free online Classifieds is a privilege, not a right. Failure to comply with the rules (click here) may result in disciplinary action. If you have any further questions you may contact myself (click here) or the PCS Committee (click here).